So it would appear that I don't have any Korean readers. When in Thailand this past weekend, I encountered the same mysterious 1000 bill that I saw in the wishing fountain at the Lama Temple of Beijing. The bill (pictured at left) is actually a Korean bank note worth a hell of a lot less than I originally thought. 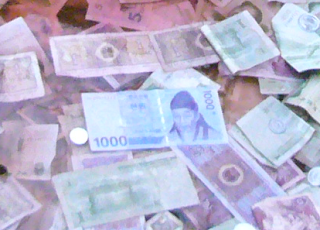 1000 Korean Won is worth roughly $0.70, not the original $146 dollars it would have been if it were 1000 Chinese Yuan. Official apologies have been issued to the Gods as my improper exchange calculations led to the underfunding of seven reincarnations during the second quarter.